Ipanema is an affluent neighbourhood located in the South Zone of the city of Rio de Janeiro (Brazil), between Leblon and Arpoador. 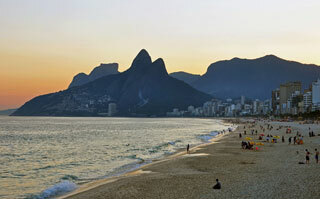 The beach at Ipanema became widely known by the song "The Girl from Ipanema" ("Garota de Ipanema"), written by Antônio Carlos Jobim and Vinícius de Moraes. This article uses material from the Wikipedia article "Ipanema Beach", which is released under the Creative Commons Attribution-Share-Alike 3.0 License.